This quote provides an initial touchstone for Pannenberg’s understanding of ontology, noting its fundamental unifying function. In addition to his stress on unity, in this early essay Pannenberg makes clear that his ontology is eschatological, since "this priority of the eschatological future ... demands a reversal also in our ontological conceptions." Here he is following thinkers like Johannes Weiss, who "discovered that ... the Kingdom of God will be established not by men but by God alone." (52, 54). For Pannenberg a key development that follows from this reversal is “the simple observation that God’s being and existence cannot be conceived apart from his rule" (55; this conclusion was also reached in concert with another student and with the examination of other relevant texts). 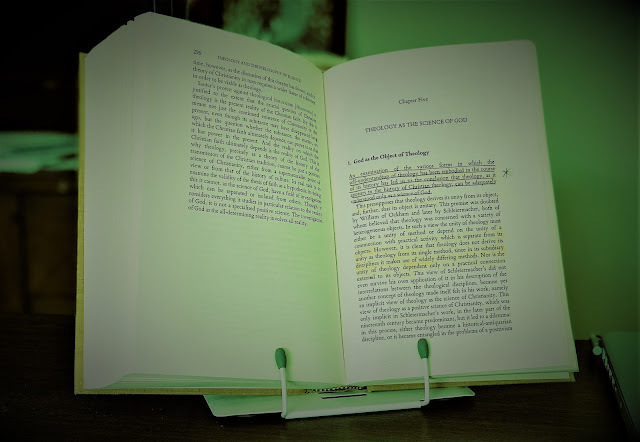 When coupled with “the eschatological understanding of the Kingdom of God” introduced by Weiss, this connection between God’s being and rule entails the judgment that “it is necessary to say that, in a restricted but important sense, God does not yet exist. Since his rule and his being are inseparable, God’s being is still in the process of coming to be" (52, 56). As noted by Philip Clayton in his preface to Pannenberg's Metaphysics & the Idea of God, this last statement points toward what he calls Pannenberg's "eschatological ontology" (viii). I'm interested to hear from my readers to what extent they believe that Clayton's description of this ontology as "controversial" back in 1990 remains true today, if at all (ibid). Regardless, I'm glad that Clayton pointed me toward this concept and text, as I find them fascinating and potentially loaded with implications for a missional portrait of God, as I hope to research and develop throughout this semester. For now however, lets further investigate Pannenberg’s belief that when considering God and God’s Kingdom “futurity is fundamental.” As he writes “to put it in the language of the philosophy of religion, the being of the gods is their power.” Thus, “the God of the coming rule is related to all that is finite and is the power determining the future of all that is present.” Believing that this conviction is grounded in “the message of his imminent Kingdom,” Pannenberg argues for the description “God as the power of the future" (53, 55-6). Pannenberg summarizes the implications of this eschatological and unitive ontology and its relationship to God; “If the Kingdom of God and the mode of his existence (power and being) belong together, then the message of the coming Kingdom of God implies that God in his very being is the future of the world. All experience of the future is, at least indirectly, related to God himself" (61). When taken with the rest of his summary one can begin to discern how Pannenberg’s ontology and doctrine of God imply panentheism. 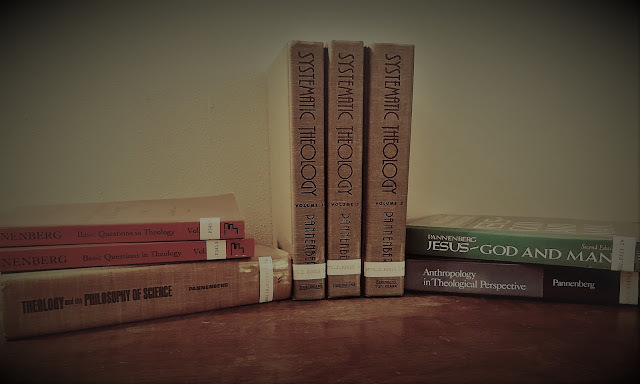 However, for now we must stop with this quick outline of these two features of his ontology, its unitive and eschatological nature, and its connection to his doctrine of God. While viewing these two components alone as comprising his ontology is almost certainly presenting only a partial picture, and the possibility for misunderstanding lurks given the brevity of the post and the use of a single source, nonetheless from my initial forays into Pannenberg and his interpreters I feel confident that these are dominant elements in his thinking, and deserve careful consideration. To my knowledge, Pannenberg never refers to himself as a "panentheist," unlike Moltmann, who embraces the term. I believe this is because he knew that panentheism was often construed along the mind-body analogy - with God being the mind and the world God's "body" - which Philip Clayton explicitly embraces. For Pannenberg, however, God cannot be or have a mind, because that would make God finite. So, in addition to your unitive and eschatological remarks, which are on the mark, you have to add P's understanding of the God-world relation. God is the true infinite that cannot be limited or marked off in any way, which implies that God is fully immanent in his transcendence. Technically, this is a form of panentheism, but unlike most other panentheisms that seem to reduce God to yet another thing alongside the world. @Ken is correct. Pannenberg never calls himself a panentheist. Panentheism and narrative theology are two things you are safe to assume get Pannenberg upset. Pannenberg's eschatological orientation fascinates me. One thing I'll wonder in the back of my mind while you continue to work through this, Derek, is whether P's futurity has much content yet, or whether that content is fundamentally undetermined. Thanks for your comments! In our class discussion today we touched on Pannenberg re panentheism. Based on what you've said Ken, it seems hard to deny that he is a panentheist (FWIW my professor didn't hesitate to use the designation). Tripp, can you elaborate further on why that description makes Pannenberg unhappy? Are you in agreement with Ken's basic point? While I certainly reserve the right to change my mind on this over the semester, from my initial engagement I can't see Pannenberg giving much content to futurity. If I understand his view of the Kingdom of God correctly and how it relates to the world, I can't imagine him "filling the picture in" much here. I've already written and presented on this in class, and over the semester I will probably try to work it out further. Tripp & Ken, please feel free to chip in here as well! Regarding the "filling in" of Pannenberg's futurity concept I agree with Derek, Pannenberg is ironically weakest where he is strongest--in eschatology. He is not very robust in terms of specifics that go beyond the outlines of his ontology and the Pannenberg Principle. I dont know if you are familiar with it or not, but Christiaan Mostert wrote a book-length treatment on Pannenberg's eschatological ontology called "God and the Future" which is a really great summary in my opinion. I think primarily Pannenberg would be unhappy with it because most panentheisms imply either that the world is necessary to God (denying ex nihilo creation which Pannenberg is insistent on) or that the world somehow constitutes God apart from his free decision. Pannenberg is quite explicit in the first volume of his systematics (sorry dont have the book with me for reference) that God does not need the world, and that the "Pannenberg Principle" (where God's being is tied to God's rule of the world) is only valid once God has freely created the world. Thanks for coming by, you're not too late! I have a growing interest and appreciation for Pannenberg, and I'm glad to hear from a "fan" of his. Your comment on panentheism & belief in ex nihilo is intriguing to me, because your way of construing Pannenberg here sounds quite Barthian (i.e. panentheism as a consequence of God's "free decision"). Are you saying that God CHOOSES to relate to the world in a manner that can be described with panentheistic vocabulary, yet shouldn't be understood as such, at least not as a standard panentheistic model, because of, as you put it, "his free decision?" If I am reading you right, this is quite interesting, and if you ever do remember the specific reference please let me know. I plan on coming back to v. 1 of his ST soon, but for class purposes I need to work through v. 3 now. On a different note, could you speak a bit more about the weaknesses you highlight? While I should have noted this in my above response to Travis and mistakenly didn't, interpreters of Pannenberg like Grenz and Timothy Bradshaw (to give two examples) have pointed out that there are positive theological reasons, not merely negative ones, for why certain elements in his thought aren't "robust." Thus, my comment above was inadequate; Grenz and other thinkers have helped me see the benefits of Pannenberg's "elusivenss" on some of these matters. Looking forward to future conversations, on this and/or future posts on WP! Thanks for hopping over to my blog! Youll have to keep me updated on what you think of vol.3, its such a beast and its been a while, I would love refreshers on it. Found the quote by the way! Its in vol. 1 of his ST p.313: "The rule or kingdom of the Father is not so external to His deity that he might be God without his kingdom. The world as the object of his lordship might not be necessary to his deity, since its existence owes its origin to his creative freedom, but the existence of a world is not compatible with his deity apart from his lordship over it." So to answer your first question I think I would say "yes" I think Pannenberg would chose panentheistic-sounding language even while avoiding many panentheist conclusions precisely because God's free decision underlay it all (c.f. ST II:30 for example). Even with the Pannenberg Principle where the world is not compatible without his rule over it Pannenberg is sort of torn between two sets of ideas. On the one hand he writes that this principle means that in Christ on the cross, God's Lordship, and so also his very essence, is put into question ("In the death of Jesus the deity of his God and father was at issue" ST vol.1 314) which sounds like its identity and essence constituting. For example Pannenberg uses the phrase (p.390) "God actualizes himself in the world by coming into it." Yet this phrase doesnt mean the same thing that Moltmann or Jungel mean by it where death actually in some sense constitutes God's identity. I think you are absolutely right to see this as a "Barthian" strain in Pannenberg, because on the same page (390) Pannenberg writes about "self-actualization" he adds that in the strict sense of self-actualization, the self can only be actualized if it is identical in the full sense with the determination which is to result from the action (i.e. self actualization rather than self actualization) Hence Barth's "God reveals Himself as Lord" is transferred over into the realm of history so to speak. To answer the eschatology questions, again I think you are right to point out Grenz and Bradshaw. Pannenberg's thought demands that certain elements remain contingent, open, not "robust" in your term. Off the top of my head I would just name two things, and I think these are things that my poor brain struggles with as much if not more than they are Pannenbeg's faults. The first one regards something that James K.A. Smith critiques Pannenberg precisely in his concept of "eschatological wholeness." Pannenberg's system seems to suggest that in the eschaton a unifying wholeness, both ontological and epistemological, will be given to the world. Smith suggests however that since it appears we are interpretive, limited beings, not just by sin but by nature, that this salvation is in fact a destruction of our finite particularity. I think Pannenberg has ways around this, but it is an issue that I think has a bit of merit. The second is just my own wrestling with the idea that the future causes things in the present. I started out as a whole-hearted apologist for Pannenberg's ideas in Theology and the Kingdom of God and Metaphysics and the Idea of God et al. Im not sure if my brain crumpled from the pressure or what but I am less enthusiastic about the idea than I was, though definitely havent closed myself off to the possibility at least. Thanks so much for this; it is quite helpful, especially the citations! The Smith critique is interesting, and given my Barthian roots much of Pannenberg's language is a change of pace for me, one that still makes me shiver at times. That said, I appreciate your reading of Pannenberg as having an affinity with/being indebted to Barth re how God relates to the world because, to be candid, I'm hoping Pannenberg isn't completely pushing Barth aside here. This concern stems in part from an understanding of Pannenberg I've been made aware of that might (overly?) minimize his indebtedness to Barth at times, or his affinities with him. While I need to think through this last point further before making any claim, in either case I'm hopeful that Barth and Pannenberg will have much to say to each other in my work. Thanks again for this conversation. I hope to have others soon. Now, off to "Theology and the Philosophy of Science" & Vol. 3!